At their initial gathering in March 2007, 55 gogos turned up. The Vernon group had anticipated perhaps 20! They decided amongst themselves to make things more manageable and formed groups according to their main interests: gardening, sewing, knitting/crochet, baking, arts and crafts. After lengthy negotiations for almost a year with the municipal council, Ginny was able to secure an unused community building as a meeting place for Sitabogogo and Families 4 Families. It was named the Ubuntu (“we the people”) Community Care Centre and now teems with activity five days a week. 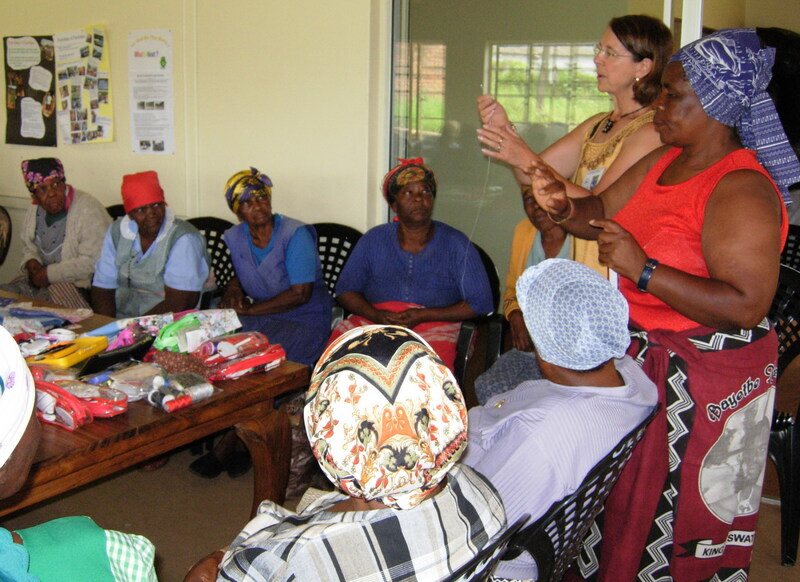 June 2012 – With knitted squares brought from Belgium, volunteer administrators Miriam and Vicky helped the Gogos stitch them together together to make blankets. See the photos. 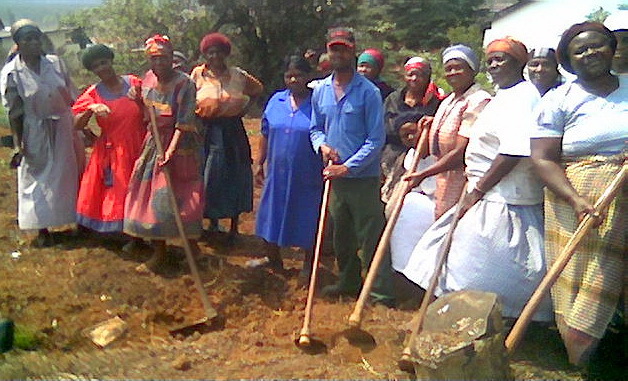 With the first funds they received Sitabogogo purchased gardening needs – spades, hoes, rakes, watering cans, a hose, seeds and seedlings. They broke the ground and prepared the soil using their own sweat and grit. A plot of land was donated to them and, as their first efforts began to produce, they then bought chicken wire fencing to keep out the fowl marauders. In the ensuing year they have made more gardens on unbroken land donated to them. Most recently Ginny has engaged an African gardening expert (named Gug) to teach composting, crop rotation, and planting specialty items such as fancy lettuces, herbs, soft fruits, with a view to marketing to local restaurants. They get three crop rotations per year. They have recently purchased a small deep freeze and the gogos can now freeze some of their surplus vegetables. As of January 2009, they have successfully launched a cottage industry and are marketing some of their produce. Next on their wish list is to purchase a couple of rain water drums before the rains come in November, so they don’t get stuck without water during the winter dry season once the plants are growing. The sewing program got a huge kick start when Beverley Barling of Vernon did an intensive sewing workshop for ten days in January, 2008. She taught them hand sewing skills, sewing machine skills (on old machines donated by their local high school), banner making for their churches (the gogos had specifically requested this), and knitting. In that short time they produced patchwork cushions, aprons, skirts, pot holders and shopping bags. 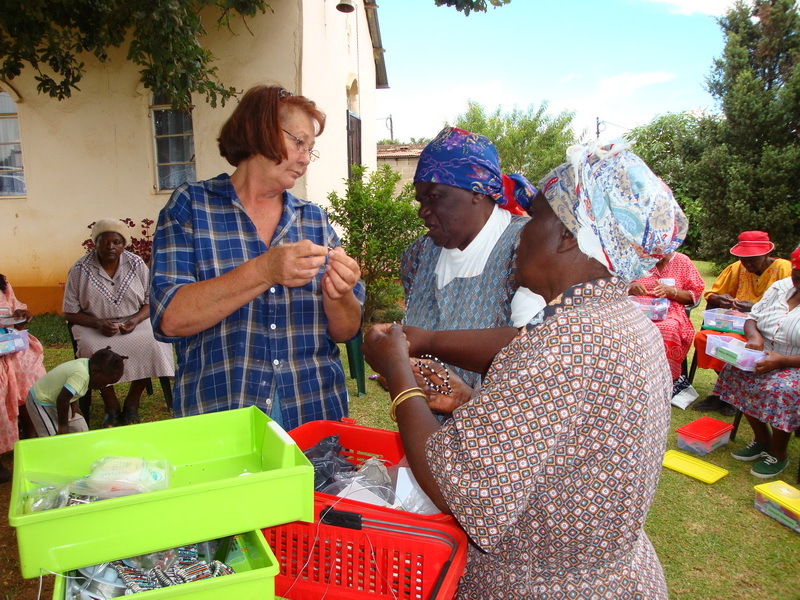 For a full account see Visits to Sabie, Grannies ‘Gogo’ to South Africa articles, particularly Article 2 which focuses on the sewing project. Beverley, her travelling companion Pauline, and Ken and Susan Fenner each carried a 50 pound suitcase of fabric collected from generous Vernon area donors, for a total of 200 pounds of material for the gogos. Since then another 100 pounds has been carried by travelers going that way. Their most recent project was English paper piecing which involves sewing together hexagon patches. They appliqué the starburst patchwork product onto cushion covers, table runners, and wall hangings. A number of the patchworks, with embroidered signatures, have been brought back for the Grannies à Gogo handicraft group to use in their creations, which in turn will raise funds to be sent back to Sitabogogo. 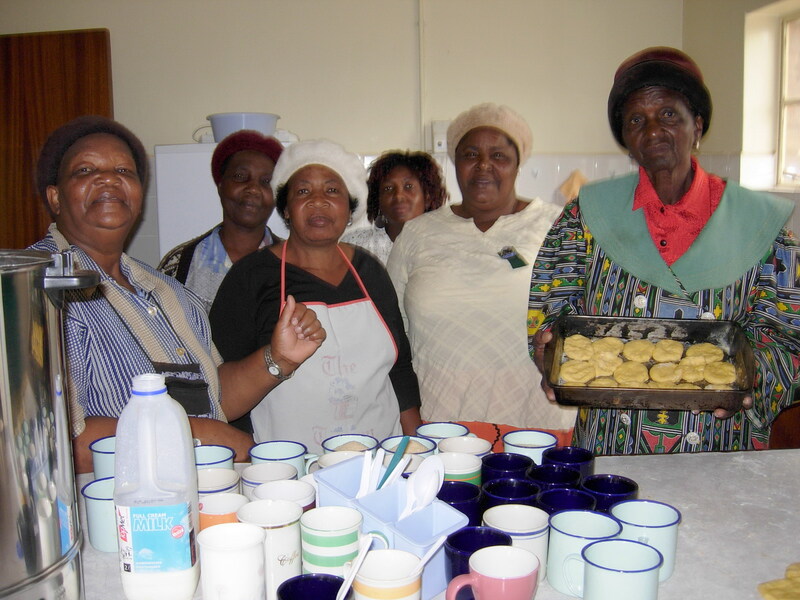 The baking group functions in a very tiny kitchen at the Ubuntu Centre. They bake bread and scones among other things, to be served with tea or soup for their lunches at the centre. For more on how baking skills are used to supplement family income, see Susan’s blog: Baking. On Tuesdays and Thursdays when many gogos are humming away with their sewing projects, several others pull out knitting and crochet needles and wool. From their needles flow scarves, baby clothes and blankets, potholders, tea cozies and a host of other items. 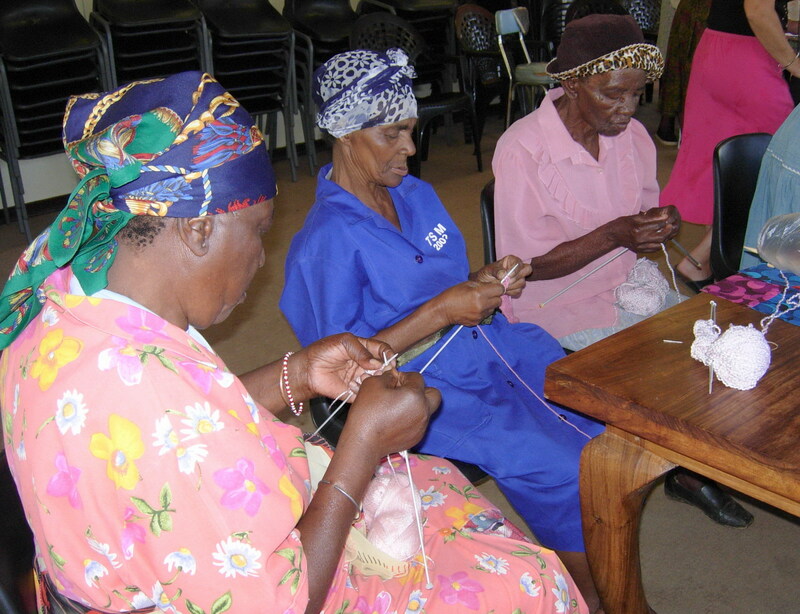 In several cases these gogos are those whose arthritic hands or poor eyesight make sewing too difficult, but they can join in socially and contribute with their knitting and crocheting. A volunteer physiotherapist and an occupational therapist began coming once a week in 2009 to lead the gogos in a 30-45 minute exercise session. Gogos exercise with a volunteer physiotherapist from the hospital. The enthusiasm of the gogos has resulted in more product than they are able to use in the lives of their families. So now they are beginning to market their handicrafts and baked goods at stalls during special events. The vision, as they develop skills to do so, is to create an organized cottage industry with regular markets, as they have done with the garden rpoduce under the guidance of Gug.